This spacious suburban townhouse, set in a fantastic location among beautiful trees and plantings, had not been touched in over thirty years. The finishes and decor were dated and tired, and some of the spaces were chopped up and closed in. 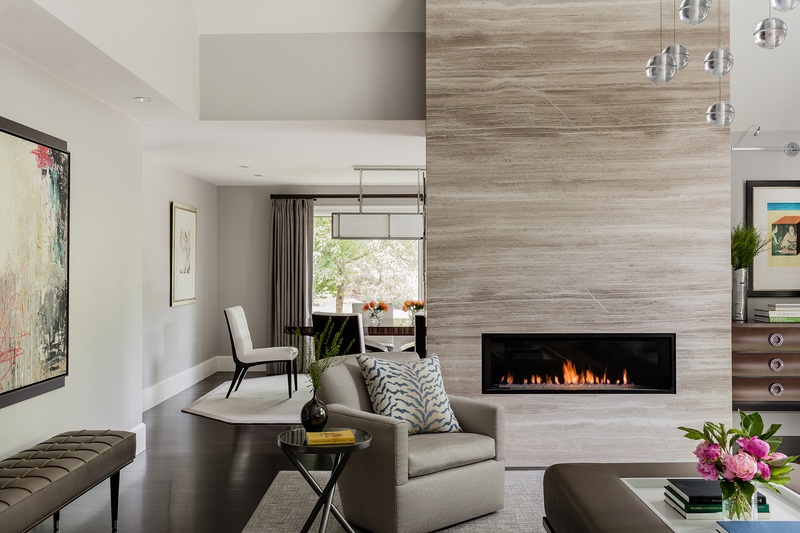 The goal of the renovation was to create a more open floor plan where possible and update all of the home’s finishes and furnishings. The over 3,000 square foot home was totally gutted down to the studs. 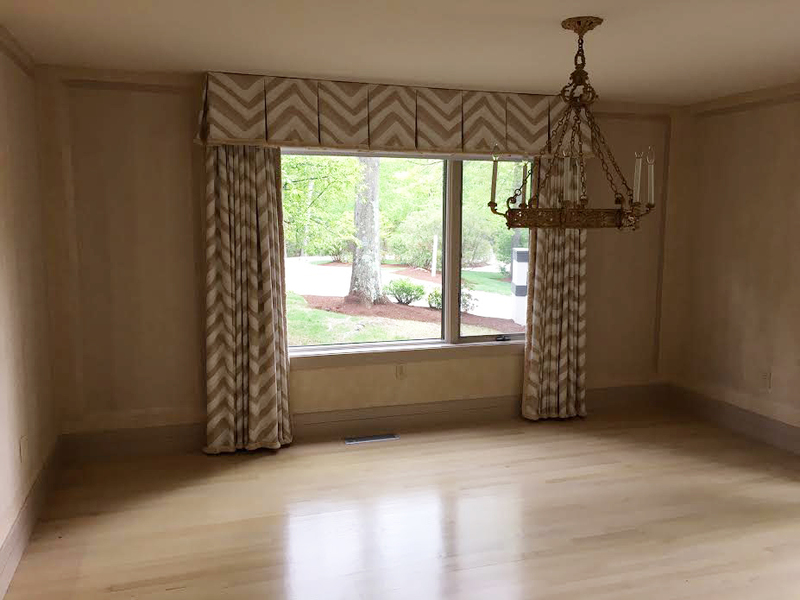 Pre-renovation, the decor of the spacious and centrally located living room and dining room was outdated and drab. 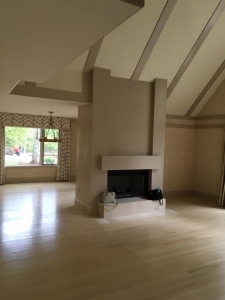 The two story living room was outfitted with an unfortunate quasi-tudor aesthetic with panels on the ceiling with an underwhelming and unattractive fireplace surround. The adjoining dining room was dark and uninviting with heavy drapes, an overly ornate chandelier and outdated sponged walls. Our task was to create a contemporary and attractive living and dining spaces that were inviting, comfortable and functional with beautiful finishes and comfortable furnishings. With new dark stained, wide plank wood flooring throughout, the eye catching feature of the living room is the contemporary, two story ribbon fireplace. 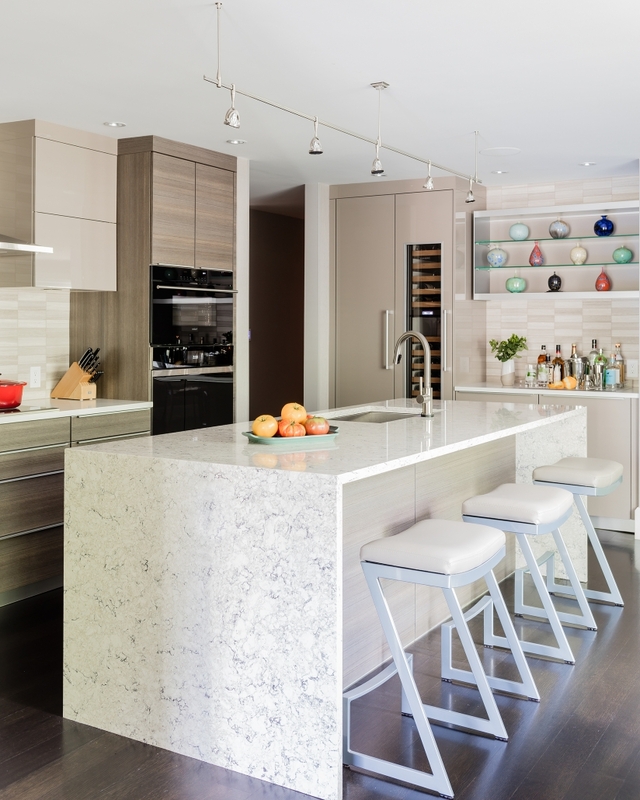 Using horizontal grained “white wood” marble slabs, this once underwhelming and dated feature is now the centerpiece of this wonderful room. 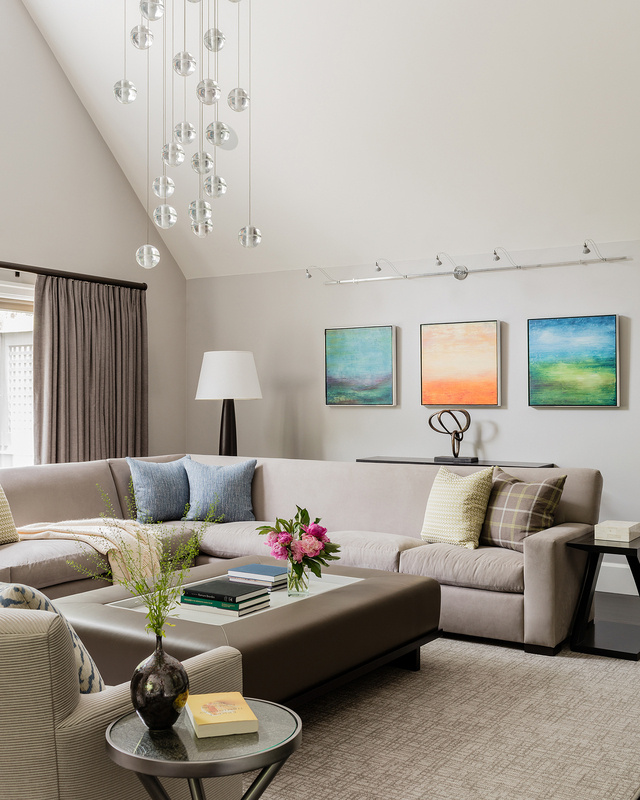 The full but lightweight drapery panels anchor the space and the hanging strands of the glass balls of the decorative fixture bring the high ceiling down for a warmer, more approachable setting. 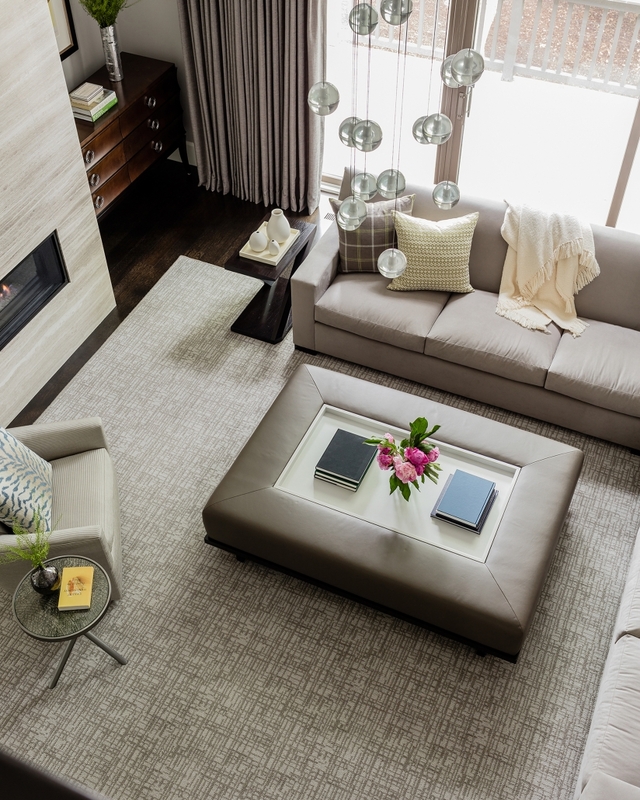 A large seating area around the fireplace using comfortable and durable textural fabrics and a large leather cocktail ottoman with a recessed tray centers this attractive but inviting living space. 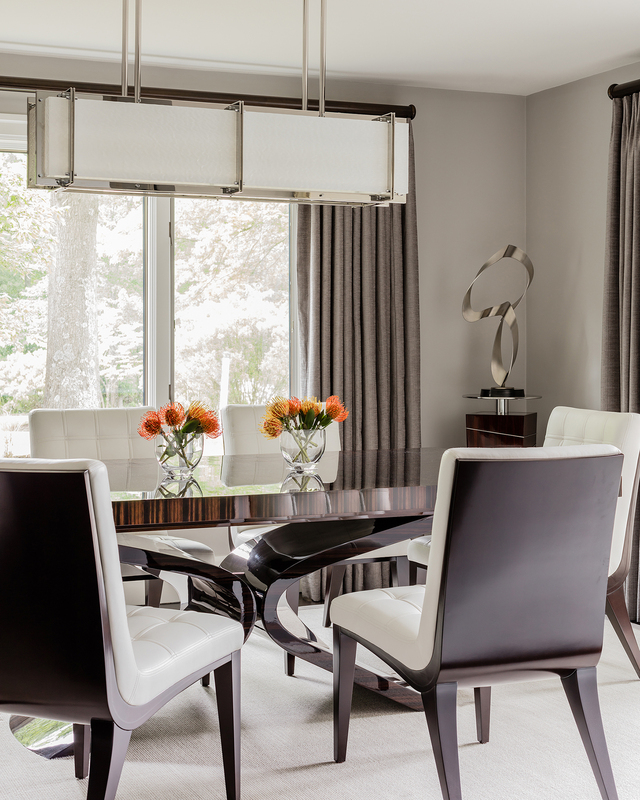 The adjoining dining room features a magnificent high gloss dining table with a sculptural base and elegant chairs upholstered in white leather-like vinyl. 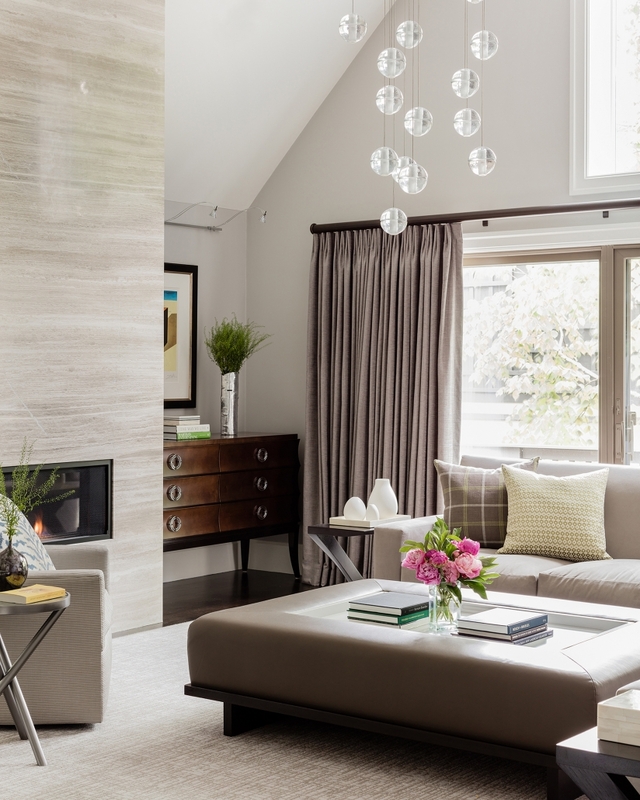 There is a sophisticated rectangular chandelier above in a bold, contemporary style. A lightweight, textured fabric is used for the drapery panels, bringing warmth and elegance to this beautiful dining space. 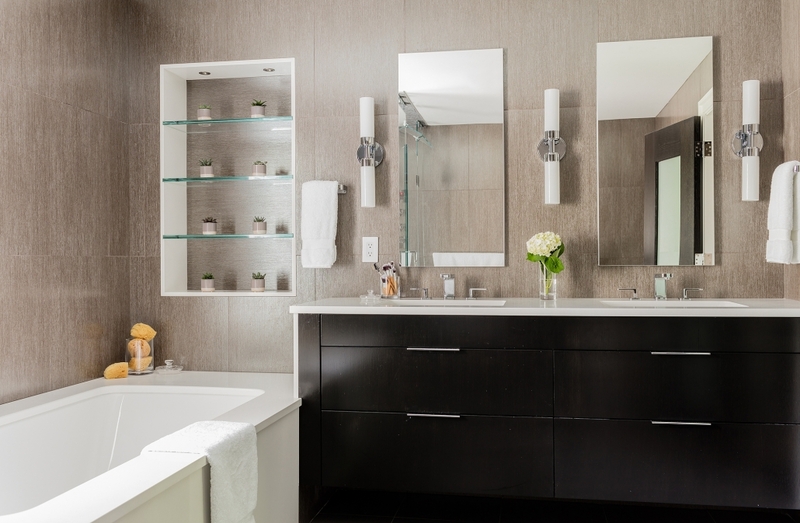 The goal of this master bathroom remodel was to create an open, airy and spa-like retreat. In its pre-renovation state, the floor plan consisted of two dark and cramped spaces, and the finishes were outdated and dismal. The floor plan was reconfigured to open up the space to create a large, light filled master bath with great style and function. 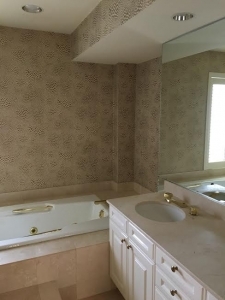 Large scale porcelain tiles are installed on the floor and on the walls. The custom vanity in rift oak is finished in a beautiful dark stain and is set off by attractive and durable white quartz countertops that displays gorgeous high end plumbing fixtures. 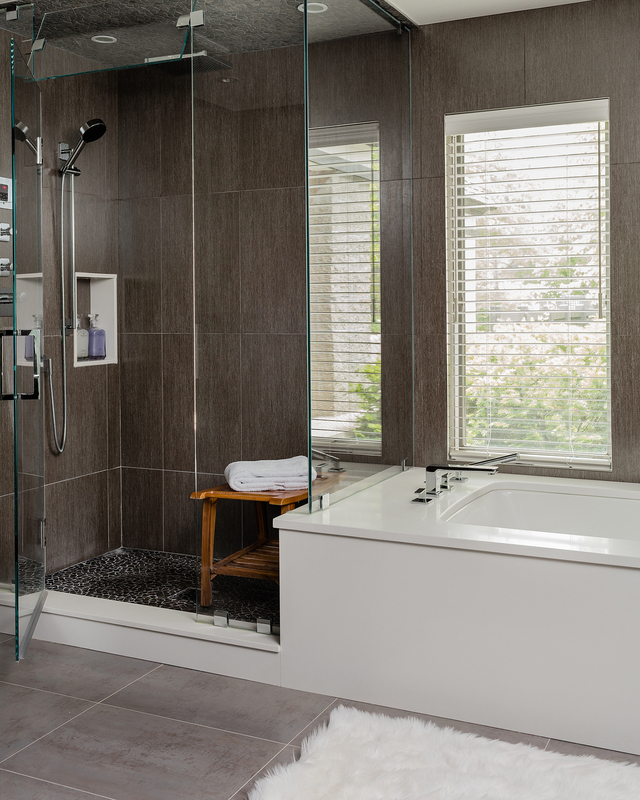 The fully equipped and inviting walk in shower is highlighted with gorgeous organically inspired river stones on the floor and ceiling, and the large soaking tub adds to this luxurious spa environment. Added bonuses include beautiful and functional recessed medicine cabinets with chic sconces for excellent lighting as well as an eye catching feature wall niche over the tub with lit glass shelving – perfect to showcase decorative objects. The entire project included custom details throughout: a new kitchen, four new bathrooms plus a powder room, new flooring, new interior doors, moldings, a comprehensive lighting plan, and a contemporary stair railing system of stainless steel, metal and wood. 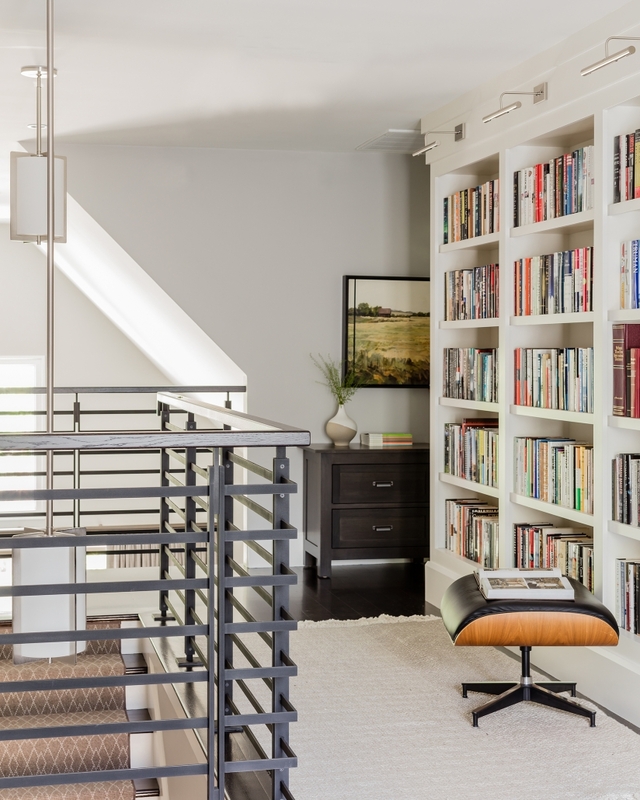 The closed in entrances between the kitchen and the adjacent spaces of the family room and dining room/living room were opened up to create a more updated, open floor plan. 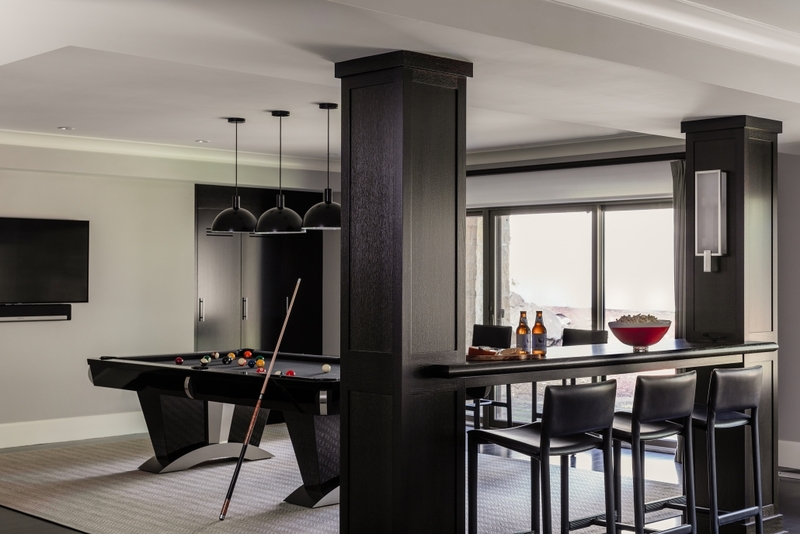 On the lower level, an unfinished basement was transformed into an extension of the home’s living space which includes high quality finishes, flooring, lighting and cabinetry for the multiple TV’s, custom pool table, game room and exercise space. Are you ready to make the home of your dreams a reality? Contact Leslie Fine Interiors today to get started on your renovation.